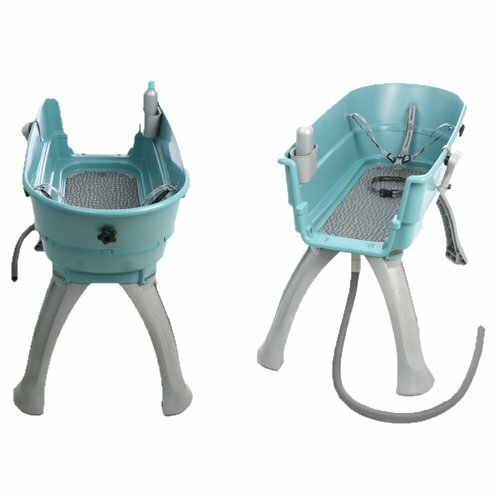 Elevated Plastic Dog Bath Tub: The Booster Bath! Paws for Thought Booster BathThe Paws for Thought Booster Bath allows dog owners to experience the most effective, lightweight, portable and affordable dog bath that thousands have fallen in love with. Finally, no more dogs in the shower or bath tub. No more chasing dogs with a hose through the backyard. Now bath time is fun and easy! For single or multiple dogs. With Booster Bath bathing your dog will take one-fourth the time and you will feel one tenth of the hassle. See for yourself just how great this product really is! We know you and your pet will love and enjoy the Booster Bath for years, as it is built to last a lifetime. Remember that proper pet grooming is an important part of your dog’s health and should not be ignored. Observing and maintaining your dog’s hygiene will ensure he or she receives more love, hugs and attention. So improve and maintain your dog’s hygiene with America’s greatest home dog bathing system, the Booster Bath. Includes, tub, quick-snap legs, all hardware to assemble (screws, rubber bumpers, mat clips, leash washers, five-star knobs), 5-foot drain line, 3-point leash restraint & collar, fan nozzle with hook and on/off volume control, no-slip mat, and a shampoo caddy. Large is designed for Breed Sizes: German Shepherd, all Retrievers and Spaniels, Bulldog, Rottweiler, Boxer, Staffordshire Terrier, Akita, Dalmatian. Weight Capacity: 150 lbs.